I am a runner. A dedicated one. I’m not marathon status, but you know, I do my fair share of 5K’s, have a PR, and try and maintain 15 miles a week. The middle aged mom, who has discovered a power within. I’ve been living this lifestyle for the past 4 years or so. And, well, got pretty hooked on the concept. I have a running buddy, we meet once a week to pound the pavement. We do races together and sometimes invite other moms to come with us. We go to lunch after the races, or shopping. We think we are road warriors but certainly know our place in the pecking order. Kenyans we are not. We just keep our feet trucking down the long black road. Last year I got a bit bored and decided I would start training for my first spring tri. No real time in mind, just a new challenge. A new power within me stirred! So, I'm doing my thing, getting up and training for this tri at 5 am at the pool, I talk my faithful running buddy to come with me at 5 am and we joke about how absolutely strong we are to be such amazing athletes to get up at 5am to swim. Who else but major athletes would do this? We run still, during our swim days and occasionally get on the bike. I am running this course and it is a straight road, no speed work, no hills, no long distance training because it's only a sprint triathlon (no biggie really, just another small challenge) and then: slam, bam, thank you mammo- I'm diagnosed! With Cancer! WHAT? Friday the 13th of February. Screech in the road. What? How is this going to effect my tri? It is monumental but all I could think of is; I will still run this tri! I have worked too hard to stop now. Are you kidding me? Is this a joke? I must run in this race. I did not realize, I was about to run a different race. So, now the road I've been running on is filled with rocks, hills, mountains even, pouring rain, waves, wind and blisters are on my feet, so it is hard to walk much less run. But, I run because a monster is chasing me. Just when I think I am at the finish line, I am not; almost, but there is more to this run than meets the eye. It's the stupid race, you know the one. The race that folks run in the desert for 3 days straight in 120 degree temps! All I signed up for, was the 5K!!!! Cancer! No one tells me, breast cancer causes one to go through so many various types of surgeries and strange procedures that it honestly hurts to run. The one thing on the planet that I have been dedicated about and helps the stress, puts too much pressure on my pecs and I can’t run! So, I walk! UGH!!!! WALK! It doesn’t help the endorphin issue much but I try and stay consistent and even keep my running log up to date with my milage from walking. My running buddy, lies and tells me she loves walking with me once a week instead of our runs because we can actually talk to each other. (she runs after or before our walks and is just being supportive and beautiful, I know she hates walking as much as I do). So, I missed my first tri and I cried, no wailed, when I cancelled it because I was so ready for it and had been training so hard for it!!! 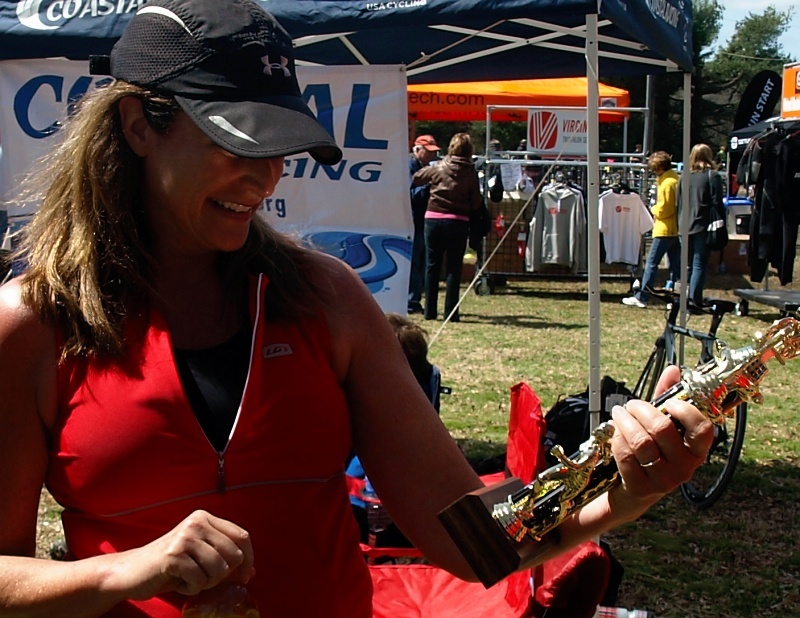 The tri was to be the day before my 44th birthday and was 4-4-09. How could the numbers be more lucky? Instead, my bi lateral mastectomy was scheduled for, Saint Patrick’s Day, March 17, 2009, another lucky day but not in the same way. 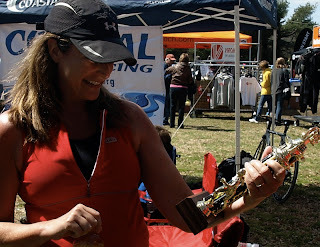 I couldn’t bring myself to cancel the tri until March, I cried so hard on the phone with the race director that the poor woman gave me a full refund. That’s not the policy and I certainly didn’t expect that, but I think I made her feel so sorry for me, so helpless. This poor middle aged woman on the phone blubbering about breast cancer and all that training and all that getting up at 5 am and all that running. For what? Little did I know, I had signed up for the larger, stupid race and one I will eventually get to the finish line of, with a cheering group of women and amazingly supportive men waving flags and chanting my name, but it's long and hard and I have blisters and it hurts! My last reconstructive surgery was August 28th and I am cleared to run soon. I will and I am really hoping to do that same tri and it’s not listed yet but if I am lucky it will be another lucky date for my 45th birthday. I had no idea that running would stir such a power within but I’ve got it and can’t wait to start hitting the road, which now is paved for me in pink. Me finishing my first tri- The Smithfield tri-I had lots of friends to support me. It was a beautiful feeling, to cross the finish line. Me with my youngest son, finishing my second tri-in White Lake, NC. 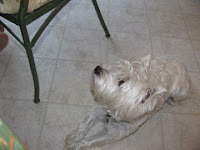 Here is Sandy, really hoping someone will drop some down to her! Not a chance on this meal!!! Of course everyone who cooks this dish, needs a little wine, "to cook with"! 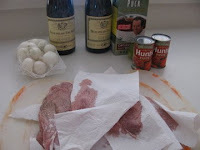 OK, I uploaded pictures of my culinary adventure! This is, by far, the longest recipe I have ever followed. It was easy but it did take forever. I started at 11:30 and ended the whole process around 4pm. I just reheated the meal on the stove top in the casserole when it was time to eat. Julia recommends this and says it tastes better when it is reheated. It was heavenly! Our house still smells fantastic and my boys both loved it but my oldest picked out the mushrooms! OK! Today I am cooking the major meal!!! I have made my list and have to buy a pot to cook it in. I only use casserole dishes or my calaphon pots usually, but don't want to mess this up- so I am going to target to get something that resembles (but is not as costly) as lecreuset dutch oven I saw in the movie!!! I am already feeling like a french chef, as I know what every ingredient on this list is, except solid chunk bacon!!! I live near Smithfield, Va , so I am thinking that will be easy enough to find! It is 9:30 and I first must take my walk. Stay tuned for the details of my cooking adventure! This is the classic, adapted from "Mastering the Art of French Cooking." A wonderful dish, raising the simple stew to an art form and quite simple to make--even though the instructions look long. 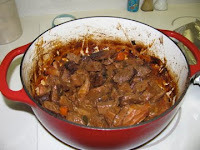 Use Simple Beef Stock, the recipe for which is posted on this site. 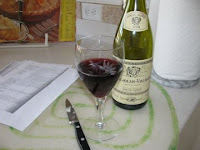 Use a wine which you would drink--not cooking wine. And the better the cut of beef, the better the stew. As the beef is combined with braised onions and sauteed mushrooms, all that is needed to complete your main course is a bowl of potatoes or noodles and lots of good bread for the sauce. 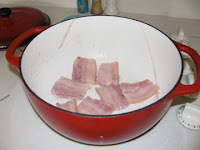 First prepare the bacon: cut off the rind and reserve. Cut the bacon into lardons about 1/4" think and 1 1/2" long. Simmer the rind and the lardons for ten minutes in 1 1/2 quarts of water. Drain and dry the lardons and rind and reserve. Put the tablespoon of olive oil in a large (9" - 10" wide, 3" deep) fireproof casserole and warm over moderate heat. Saute the lardons for 2 to 3 minutes to brown lightly. Remove to a side dish with a slotted spoon. Pour off the fat and return the lardons and the beef to the casserole with the carrots and onion. Toss the contents of the casserole with the salt and pepper and sprinkle with the flour. Set the uncovered casserole in the oven for four minutes. 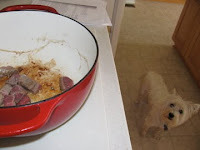 Toss the contents of the casserole again and return to the hot oven for 4 more minutes. Now, lower the heat to 325°F and remove the casserole from the oven. Add the wine and enough stock so that the meat is barely covered. Add the tomato paste, garlic and herbs and the bacon rind. Bring to a simmer on the top of the stove. Cover and place in the oven, adjusting the heat so that the liquid simmers very slowly for three to four hours. The meat is done when a fork pierces it easily. 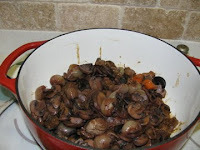 While the meat is cooking, prepare the onions and mushrooms and set them aside till needed. For the onion, if using frozen, make sure they are defrosted and drained. Heat the butter and oil in a large skillet and add the onions to the skillet. Saute over medium heat for about ten minutes, rolling the onions about so they brown as evenly as possible, without breaking apart. Pour in the stock, season to taste, add the herbs, and cover. Simmer over low heat for about 40 to 50 minutes until the onions are perfectly tender but retain their shape and the liquid has mostly evaporated. Remove the herbs and set the onions aside. For the mushrooms, heat the butter and oil over high heat in a large skillet. As soon as the foam begins to subside add the mushrooms and toss and shake the pan for about five minutes. As soon as they have browned lightly, remove from heat. 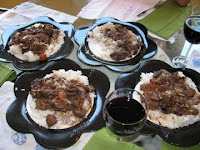 When the meat is tender, remover the casserole from the oven and empty its contents into a sieve set over a saucepan. Wash out the casserole and return the beef and bacon to it (discarding the bits of carrot and onion and herbs which remain in the sieve). Distribute the mushrooms and onions over the meat. Skim the fat off the sauce and simmer it for a minute or two, skimming off any additional fat which rises to the surface. You should be left with about 2 1/2 cups of sauce thick enough to coat a spoon lightly. If the sauce is too thick, add a few tablespoons of stock. If the sauce is too thin, boil it down to reduce to the right consistency. Pour the sauce over the meat and vegetables. If you are serving immediately, place the covered casserole over medium low heat and simmer 2 to 3 minutes. Serve in the casserole or on a warm platter surrounded by noodles, potatoes or rice and garnished with fresh parsley. If serving later or the next day, allow the casserole to cool and place cold, covered casserole in the refrigerator. 20 minutes prior to serving, place over medium low heat and simmer very slowly for ten minutes, occasionally basting the meat and vegetables with the sauce. I just got back from the movie Julie and Julia and it inspired me!!! In many ways, actually, but mostly to cook and to blog. OK I know my blog is a crazy hodgepodge of stuff. There isn't one focus and I have no clue how to do it any other way. 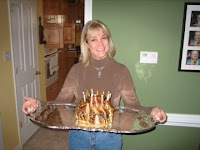 I loved Julie's idea of following a cookbook all the way through and writing about it each day. I would love to be that disciplined. I really have no clue what to narrow a blog down to. I have random thoughts and things come to me at various time. The no brainer would be breast cancer and the trials and tribulations regarding all I am going through this year. Honestly, I have a ton to say on the subject but all of it depressing and I really would rather be more uplifting in my spare time from the constant disaster that is currently my life! Until a focused revelation comes my way I will have to work on my other inspiration from the movie...cooking!!!!! OK, I love to cook but only sometimes! Mostly I think of it as a chore and not the joy it can be. Plus, my husband is a great cook and does the chore more often than not. I am going to start my new mission with my tried and true cookbook. It's a compilation of all my Grandmother's dishes (in her writing, no less). Right now I have a repertoire of about 20 different dishes I make over and over. Most of them I know by heart by now. It's easy and safe and did I say, easy? I know what to buy at the grocery store. I know approximately how long it will take me. I know mistakes I have made in the past and what not to do. I know which of these my kids will eat and which one's make them squish their noses like only kids can! I am throwing all that knowledge out the window and making a new recipe of hers. Tonight!!!! Who knows, if I relax in this way, perhaps a revelation on what to focus my blog on will occur? Why do all kids like building forts? They are so into it. My oldest son used to make them with blankets, couch cushions and the table. Then both boys moved onto building them with blankets on the bunk bed they used to share. When I walked in after showering when they were around 6 and 3, every sofa cushion was gone, no blankets could be found and the dining room table chairs were all on their sides . They were outside playing (we had a small fenced in backyard), after building the largest fort known to mankind and I had no place to sit!!! I think it is metaphoric in a sense. Building is the most important part of relationships: friendships, marriage, children and parent relationships and business partnerships. If you don't trust the foundation, how do you know the structure will stand? Much trial and error is needed, just like the pictured fort! 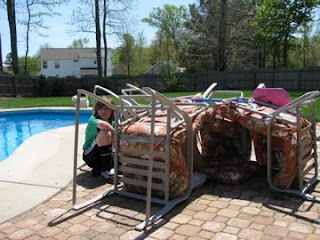 As I sat in the sun relaxing, Bryce worked on that fort for at least an hour. He tried chairs in different positions, cushions every which way, there are several sticks holding up the chairs so the weight of them wouldn't topple everything. Sometime there is no base, there never was one and so then it is hard to have any type of building when you are starting with nothing. Only years of memories with no base. This is what causes all relationships to end. No base. It's not about you being a rebel with your parents, it's about them never being a structure to stand on or relax under. It's not about your husband lying to you. He never had a base in his own head, because of how he was raised. It's not about your friends being mean or rude, it's about learning how to pick the right friends that you can form a good solid foundation on! Business structure must start from a good base, either great management skills or a fantastic partner or it is doomed to failure. How is your fort, coming along? If it has no base, you must do what kids do and tear it down and start over, this time with a solid foundation! Here is my most recent commercial. This was cut in January of 2009. I had a blast being around all those new cars. The night I was there, it was preview night for car dealers and employees. It was a lot of fun to be doing my job along side all the big shots in town! :) Channel 13 did the shoot. The photog Ryan Beard, was particularly helpful! Thanks Ryan!! !